Spending over £2000 on an AV receiver is no frivolous matter. Good thing, this Denon AVR-X6400H – one of Denon’s top AVRs for 2017 – takes its job seriously, then. Imagine the refined £500 Denon AVR-X2400H, but with a bigger, bolder and more confident presentation. Voices, in particular, are a high point for this Denon amp. Play the opening scene from Guardians of the Galaxy Vol. 2 and varied tones of voices from all characters are communicated wonderfully. System of a Down’s B.Y.O.B. requires more aggression and grunt than this refined amplifier is comfortable giving, but the Denon’s articulate and precise character suits Nine Inch Nails’s This Isn’t The Place beautifully - it ramps up the tension in the song while keeping every musical strand organised. We’d still recommend diving into the manual speaker settings to double-check and fine-tune the numbers further if needed. Happily, Denon’s menus are nicely laid out and easy to navigate, so there's no need to be daunted even if you’re an AV newbie. 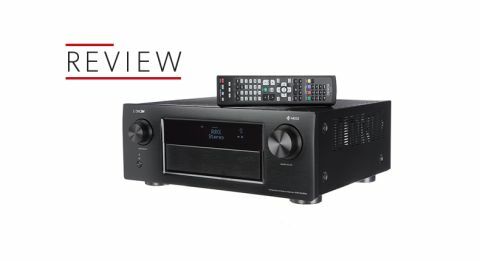 Denon has gone to great pains to ensure anyone buying its £2300 AV receiver isn’t left wanting when it comes to the latest film and music playback technologies. A terrific performer, this Denon AVR-X6400H would be a worthy addition to virtually anyone's home cinema room.